Looking for other walks in Tasmania? 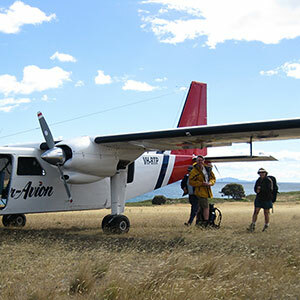 There are 2 ways that you can access Maria Island, by ferry, or by a spectacular charter flight. The choice is yours. Your 4 day Maria Island Guided Walk starts with a picturesque drive to Triabunna or you can choose to board a sensational scenic flight from Hobart to Maria Island via the spectacular sea cliffs of Tasman Island and Tasmania’s East Coast. Once on Maria Island your guides will immerse you in the islands history and lead you on an amazing 4 day exploration. You’ll experience close encounters with wildlife and marvel at spectacular cliffs, beaches and Maria’s convict past. The walking each day is gentle but reasonably good walking fitness is required to manage the daily distances. Your pack will be light and you are only required to carry your personal belongings for 2 out of the 4 days. If you are unable to carry your pack, we can carry it for you. Your accommodation is in large twin share Safari Tents with comfortable stretcher beds for 2 nights and 1 night in the converted Penitentiary Cell shared accommodation if available. Your meals are of fresh local produce with 3 course dinners complimented with fine Tasmanian Wines. You can choose to join after dinner activities such as, stargazing; devil spotting or you can just relax around camp. Maria Island at night has a natural “dark sky.” For sky-watchers our computerized Go-To Telescope will bring the Solar System and Constellations within our Galaxy, closer to you. Be amazed as you view planets such as Jupiter and its 4 moons or Saturn and its rings. Day 1: 14km – Flat terrain, coastal beaches and easy tracks. Pack carrying day. Day 2:	14km to 20km – option of 2 destinations, flat terrain, coastal beaches, easy tracks and slight hills. Walking without a pack. Day 3: 11km. Easy tracks & slight hills. Pack carrying day. Day 4: 5km circuit plus the extra option of climbing Bishop and Clerk. Walking without a pack. Click on the BOOK NOW button (flight or ferry option). This will take you to a secure online payment system, select your departure date from the calendar, fill in your details and submit. Having difficulties booking online? Please email us at info@mariaisland.com.au and we will email you a booking form. Refunds and Cancellations - If for some reason you are not able to partake in the booked tour / activity and you wish to cancel, our refund policy is as follows: Cancelling for tours / expeditions up to six weeks prior: A full refund less the 10% booking fee will be refunded. From 6 weeks to 3 weeks prior: a 50% refund will be given. Up to 3 weeks prior to the tour no refund is due. If you wish to transfer your booking to another date this can be done up to 6 weeks prior only. *Deposits are non-refundable. We reserve the right to alter, delay or cancel a tour due to extreme weather conditions, bushfires or sudden track closures. Flight Option requires a minimum of 2 Passengers.